In the Gulf, in the North Sea, we won't die for oil profits. Support North Sea strikers! Class war not oil war! Leaflet produced in the lead-up to the 1990 Gulf War, linking the deaths of workers on North Sea oil rigs, and workers at war. Every day more and more troops and military hardware are being moved into the Gulf, making war increasingly likely. If a war does start, working class people on both sides will be slaughtered. Our rulers tell us that this is a price worth paying (and make no mistake they want us to pay this price), in the interest of fighting against tyranny and to liberate Kuwait. This is all rubbish- they want us to lay down our lives in a war over oil. Former head of the American Council of National Security, Zbigniew Brzesinzki, has stated this bluntly: "The real vital interest for America in the Kuwait crisis is to ensure that the Persian Gulf remains a sure and stable source of petrol to be sold at a reasonable price to the industrialised West . Another US politician summed the situation up even better: "If Kuwait grew carrots, we wouldn't give a damn". It is not just in the Gulf that we are expected to die for oil company profits. Recently North Sea oil workers have been taking strike action and occupying rigs in a struggle for safer working conditions. 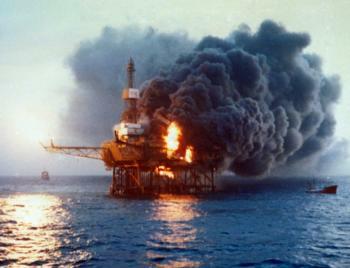 In the 20 year history of the North Sea industry, there have been 492 deaths, including 167 in the 1988 Piper Alpha disaster. These deaths have been caused by oil bosses putting profits before safety. To put a stop to our class being massacred on battlefields, oilfields and elsewhere, we need to step up the class war, through strikes, mutinies and other action. There have been strikes recently by Japanese seafarers being sent to the Gulf, and by workers on US bases in Turkey; there have been reports of Iraqi soldiers deserting from the army. By spreading and linking up such struggles across the world, we can not only sabotage the war machine but also sweep away the whole system that sacrifices our lives in both war and peace.